i own a usr2249, how could i read the power (in dBm) received? is it possible to scan the others? i'm a french guy, please write to me with simple words! i've written a software to create meshed networks with 3 UNIdirectional antenna for each (like bee nets). Votre anglais n'est pas un probleme. thank you for your url, but the problem is for an AP behind a network card (rj45)! I don't think that measurement is possible with that model. Unless the AP provides that information directly via a client configuration screen. The Dlink DWL900 is similar to the USR2249, Dlink might have a utility to measure RF when it is in client mode. the utility is not able to measure the power! 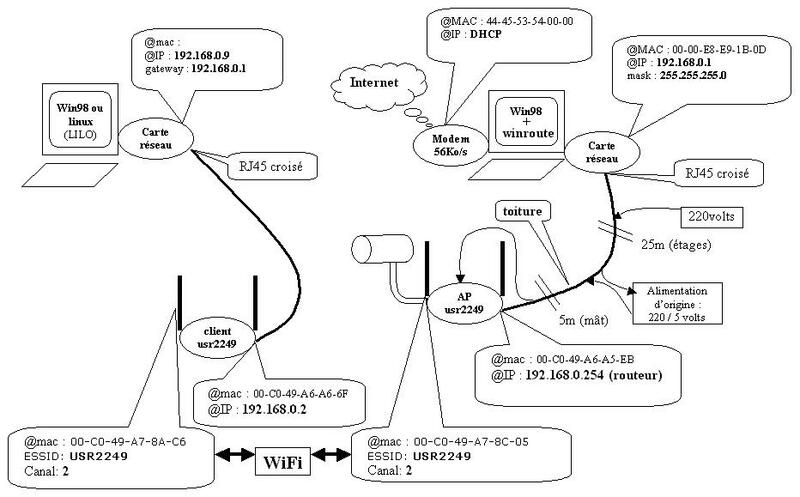 the utility show the mac addresses of the clients, but nothing else! You could try just removing the card from the AP and put it into a laptop. Then you could use wlan client tools (linux or windows) that support the card's chipset. if i would put a card in a laptop, i would't buy an ap! i need to put it on the top of my house (with poe 25m). this is were it is right now! I misunderstood, I though you just wanted to measure the receive capability of the card once and not measure it when it was in use. Other than modifying the AP firmware, I don't think its possible to make the measurement you want. After reading through your site, I guess you want this capability so you can aim your antenna more precisely. Is this correct? Another thought is using a Linksys WRT54G. It lets you load linux as well as some applications. 25 meters seems like a very long distance for POE, do you experience a significant voltage drop? "aim your antenna more precisely". exactly. with +-1°. Linksys WRT54G seem to be very interesting. i show 20m of POE for 220V AC, and 5m for 5V DC. Ideally, you could use a spectrum analyzer if you have 5 or 6,000 euros laying about. If you don't want to buy a spectrum analyzer and don't have direct access to the card, you might be able to do something like a packet flood or custom ping. I was thinking of a script to ping a port and capturing the time.